Pete Van de Putte — owner of Dixie Flag Manufacturing Company and husband of former state Sen. and San Antonio mayoral candidate Leticia Van de Putte — changed his mind Tuesday and decided to stop making and selling Confederate flags. 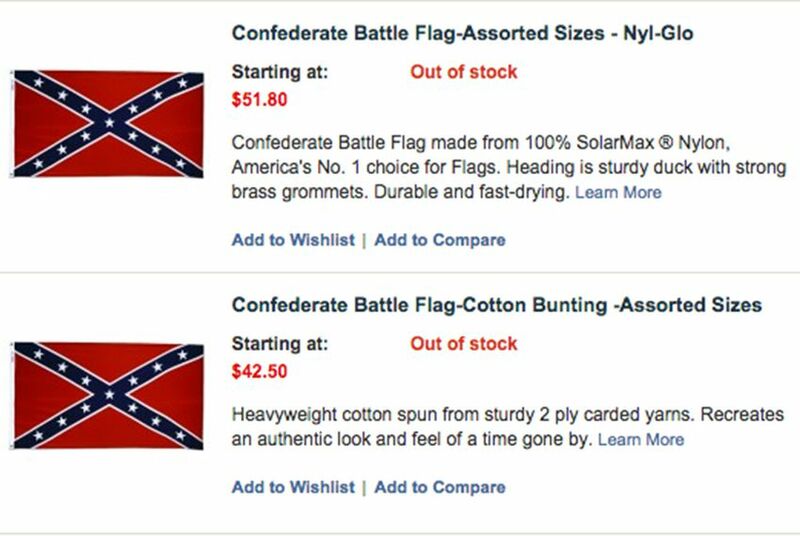 Screenshot of out-of-stock Confederate flags from Dixie Flag Manufacturing Company in San Antonio, Texas. As major retailers abandoned sales of Confederate flag merchandise in the wake of the South Carolina church massacre, Pete Van de Putte — owner of Dixie Flag Manufacturing Company and husband of former state Sen. and San Antonio mayoral candidate Leticia Van de Putte — eventually decided Tuesday that his company will stop selling the Civil War flag. When first contacted Tuesday, Van de Putte said he had no plans to stop manufacturing the Confederate banner. Later in the day, however, he said, "We've decided as an industry we don't need to fuel this fire. We're taking the product out completely." Van de Putte said Dixie Flag will remove the flags immediately from the San Antonio store and its website. Van de Putte's wife ran unsuccessfully last year for lieutenant governor as a Democrat. Earlier this month, she narrowly lost the runoff for mayor of San Antonio, a race in which her husband's flag-making store was briefly an issue. The San Antonio Express-News reported the business had more than $100,000 in tax liens over the past five years, an issue Pete Van de Putte said he fully resolved in the lead-up to the election. Retail powerhouses Amazon, eBay, Walmart and Sears have announced over the last few days that they will discontinue Confederate memorabilia as pressure mounts to remove the Confederate flag from South Carolina's Capitol following the murder of nine people at a historic black church in Charleston. Yet sales of Confederate flags at Dixie Flag have jumped, Van de Putte said, and the store sold about 25 flags in one day compared with usual sales of about four a week. "If you have one of those flags, you might want to hang onto it because you won't be able to find one made in the U.S.," Van de Putte said.